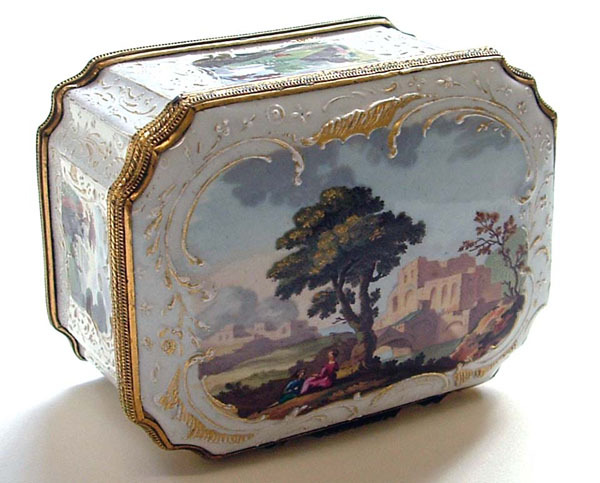 Summary: Oblong box with chamfered fluted corners and enamel painted scene of rustic lovers on a river bank. Description: Enamels were made in Bilston from the late 18th century. 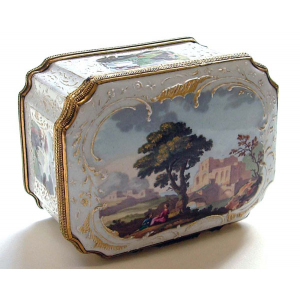 Enamel boxes were made on copper with powdered glass which melted during a firing process. The four centres which made most of the enamels in Britain were London, Liverpool, Birmingham and Bilston. Enamelling in Bilston began when a number of French craftsmen, reputedly Huguenots, moved to Bilston from France in about 1745. Huguenots, or Protestants, were being persecuted and sometimes killed by Catholics as disagreement between the two faiths grew. By the 1790s there were numerous enamel workshops in Bilston. With the introduction of transfer print designs instead of artists painting each detail, enamels could be made faster. By the 1820s, demand for enamels was declining. There have been various suggestions to explain this such as changing fashions, the Napoleonic wars and the Industrial Revolution. By the 1850's many enamel workshops in Bilston had closed.